And that’s exactly what we get with Hellboy creator Mike Mignola (pronounced Meen-YO-la) as he went from staff artist to, well, himself. 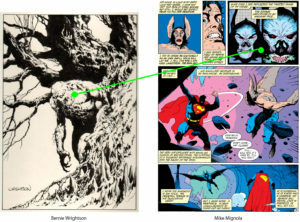 There’s Arthur Rackham-like trees in World of Krypton and Barry Windsor-Smith in the characters. There is his John Romita Sr. style of storytelling in Phantom Stranger. There’s Bernie Wrightson in every monster he draws. But mostly, there’s an artist who’s not terribly engaged by “the house style” and cape stories. 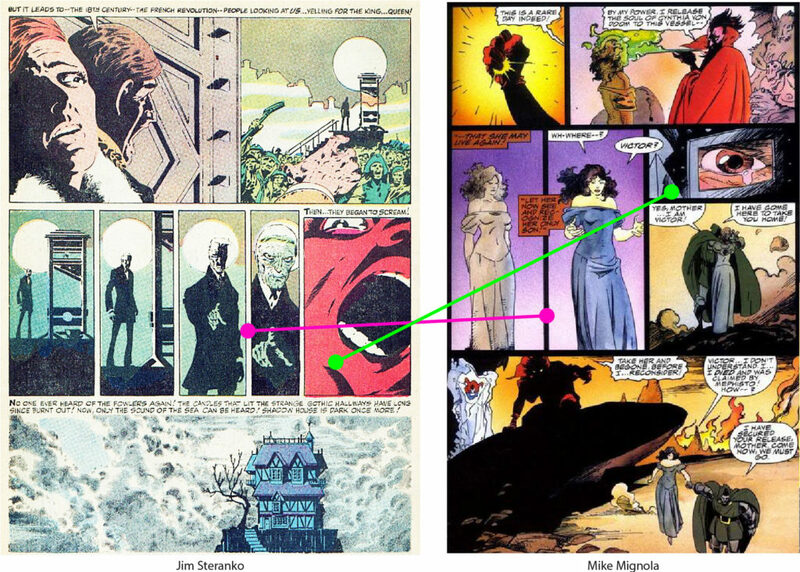 Looking back, it’s easy to see the trajectory that Mignola’s career would take. Open up Action Comics #600 and see how much time and care he spends on Manbat, and how the monster is the central figure whenever possible which sorta pushes Superman out of his own book. Around the same time, you can see Mignola straining at his yolk as he filled a few Spectre covers with his (soon to be) trademark skulls. 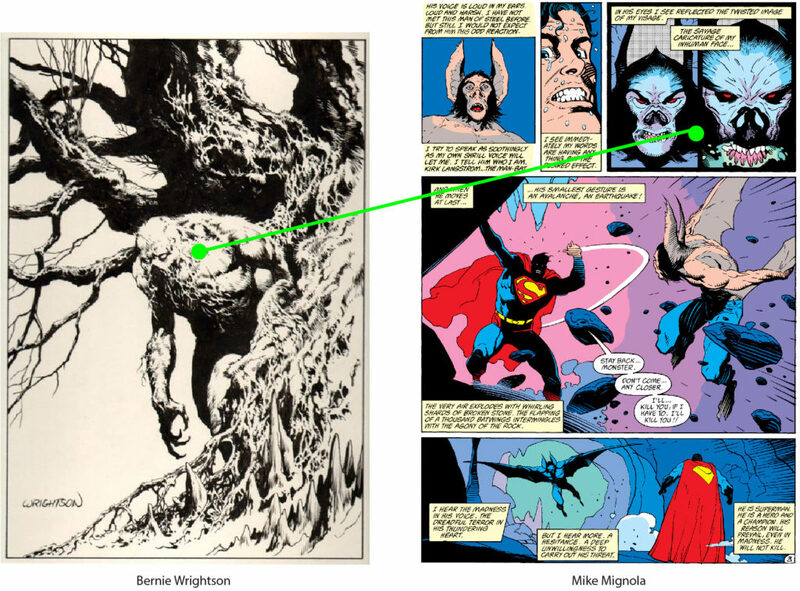 But the big change, according to Mignola, was realizing that he couldn’t draw well enough to copy his heroes, but he could make something interesting by combining every one of his extensive influences. This might be the ignition point for Mignola on all fronts. Meanwhile, Mike Badger’s dramatic inking and gorgeously subdued water color work gives this story a beautiful, moody piece that makes that truly evokes a place and time. So many pages feel lit by fire, which is perfect for this kind of Gothic and ghostly tale. 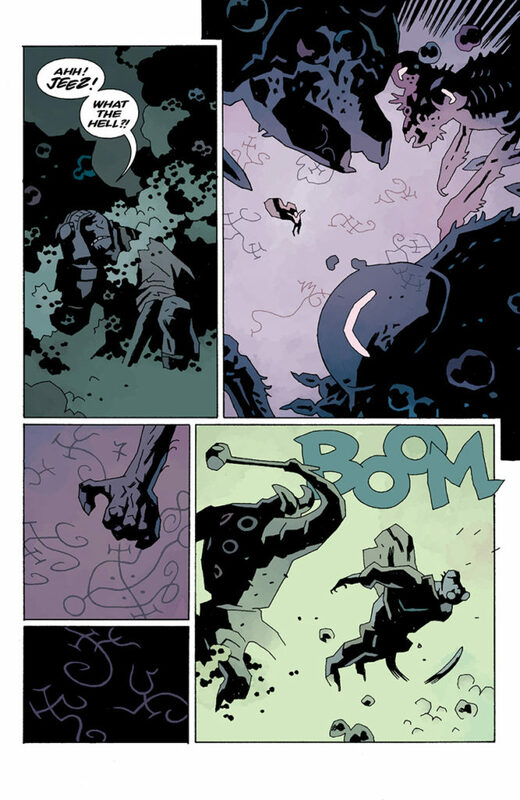 For his part, Mignola’s pencils start to really take some chances. 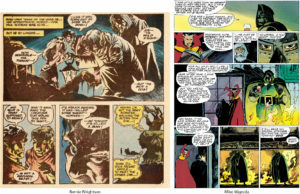 There’s still some house style choices at play — particularly as he begins to experiment with Jim Steranko’s use of time and progression (as well as cribbing his version of Doctor Doom’s face) — but once the characters get to hell you can see Mignola start making his own stylistic choices. Here he borrows more of Bernie Wrightson’s dramatic lighting (which Wrightson himself had borrowed from classic monster movies from Universal Pictures). Still, it’s a half-measure when compared to what’s coming. 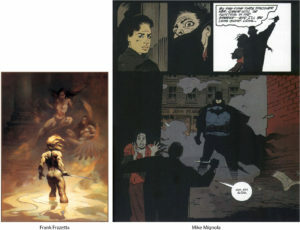 Brian Augustyn’s story about a Victorian Age Batman defending London from Jack the Ripper seems like perfect fit for Migonla’s burgeoning style. A city of mostly shadow, coal smoke, and weathered limestone feels, in many ways, like a beta test for Hellboy. 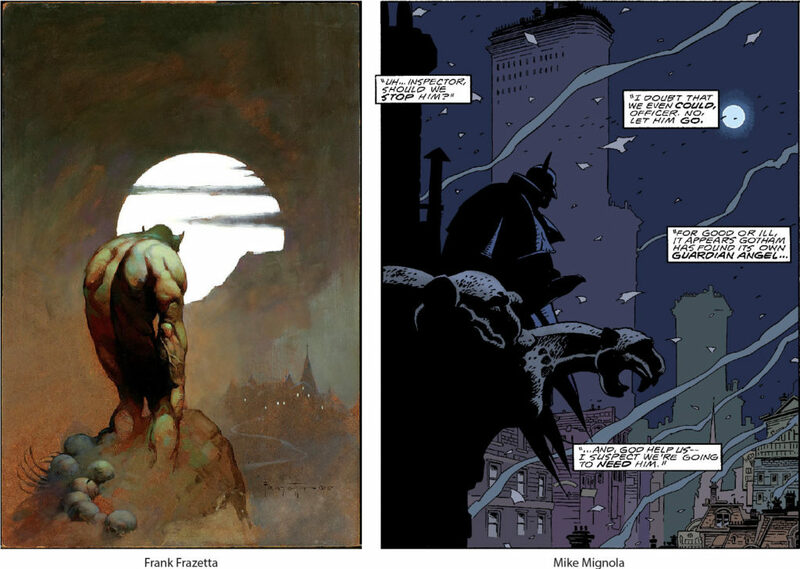 Mignola had been working towards adopting some of Frank Frazetta’s posing in Triumph & Torment, but he really brings it home here in Gotham by Gaslight. Look at his compositions: Batman stand so solidly and with real weight in his posture, just like one of Frazetta’s covers, but that’s the obvious part. Look at the light/dark values in the piece and the way Migola uses his light sources to push characters apart from each other. Mignola followed this up with Batman: Sanctum (Batman: Legends of the Dark Knight #54), his first attempt at plotting. 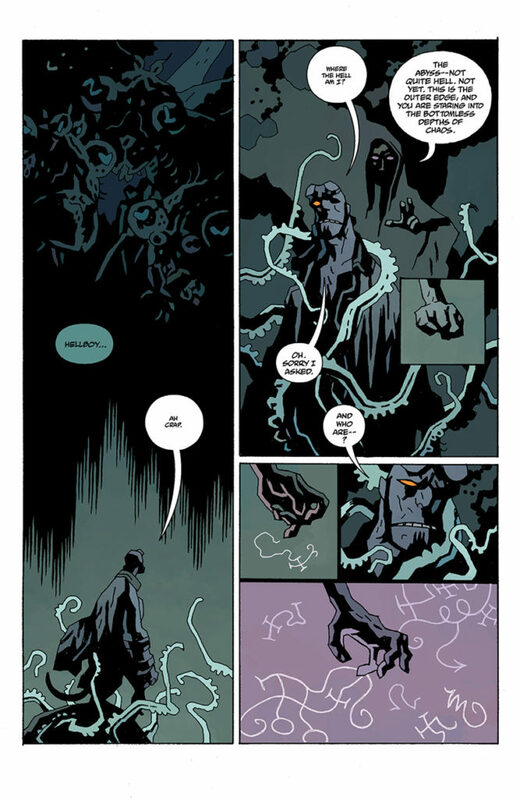 It’s a tidy little story where the artist minimizes everything he hates to draw (cities, cars, superheroes) and maximizes what he actually loves (skeletons, H.P Lovecraft, Alex Niño psychedelia). The book was a moderate success and paved the way for what’s to come. “Hellboy” wasn’t originally a character. In fact, he wasn’t anything at all. Mignola has said in a number of interviews that Hellboy started as “a collection of shapes I like to draw.” Overtime, the sketches got refined. 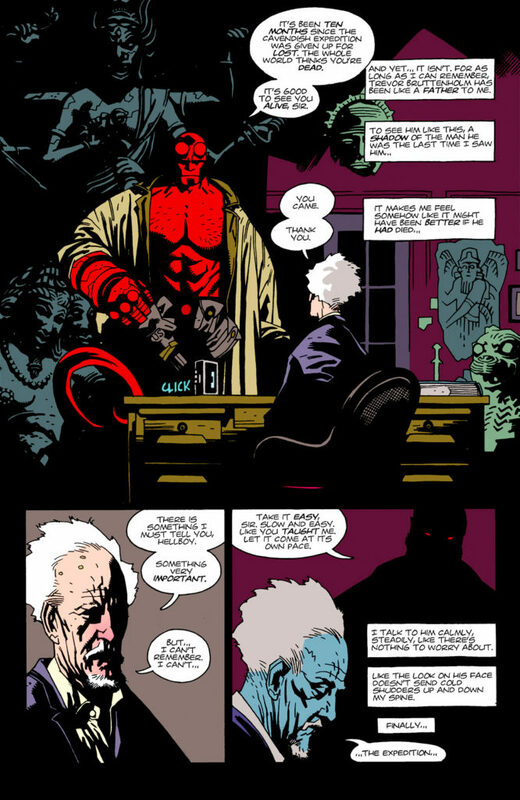 Hellboy became less bestial and started to take on more characteristics of pulp characters until the napkin doodle became a real character and finally a book. The initial plan was for Mignola to handle art duties while legendary comics author John Byrne would handle most of the world building. 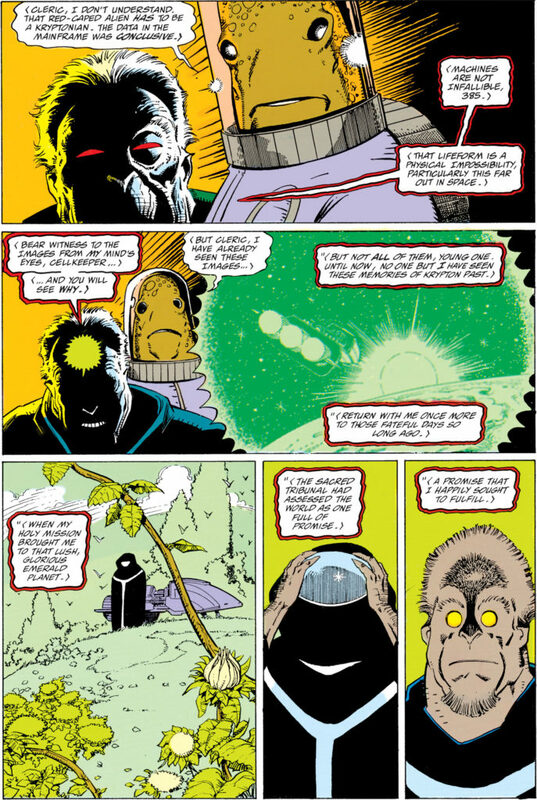 But as Mike grew confident, Byrne stepped aside and let him take on more and more of the job until Mignola had plotted the entire thing and Byrne was left to only help on the scripting (or writing dialog). I absolutely love this book, and it’s interesting to see how the series changed after this first volume. This book, with its narration and pacing, feels first like a pulp novel first and a horror novel second. You can even see it in the artwork, where the layouts are more action-oriented. 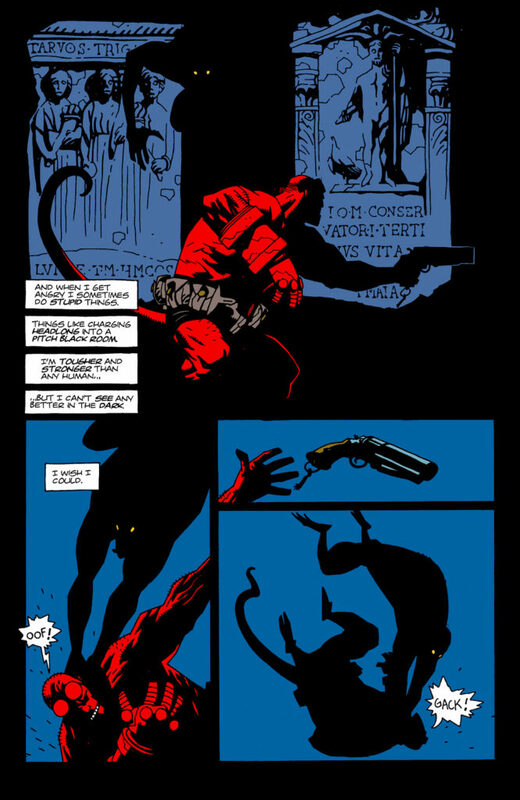 This was followed shortly by the short story The Corpse, which was one of Mignola’s first attempts at handling all major story positions (plotting, scripting, and illustrating). 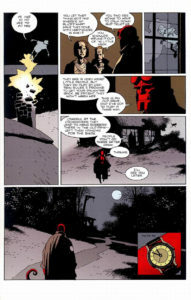 This may very well be the best Hellboy story. 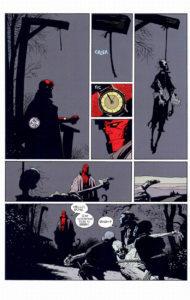 It has everything: archaic folklore, Hellboy’s “workingman attitude,” humor, tragedy, and incredible layouts. Honestly, some of the best panel work is in this 15 page story. The result is a clearer, more confident vision. 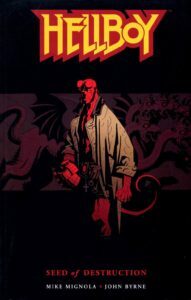 Without the crutch of narration, this story is allowed to grow in complexity, finally letting Hellboy jump into surrealism with both feet. 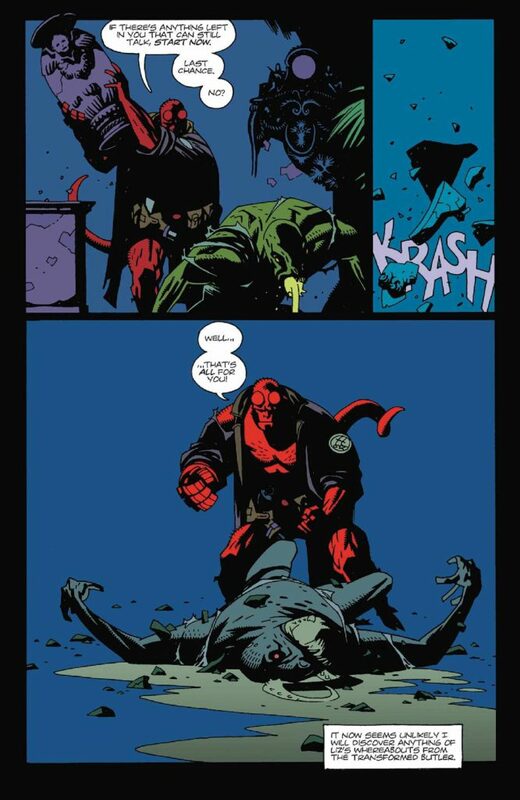 And it might just be me, but Hellboy himself seems to grow as a character here as Mignola draws his eyes more, suddenly letting the character show his feelings rather than tell them. These subtle elements combine in such a way as to give the entire book — art, jokes, tragedies, artistic influences, everything — a brilliantly peculiar flair which Mignola would employ through the rest of not just this series, but a whole world dedicated to Hellboy’s team, the Bureau for Paranormal Research and Development (BPRD). 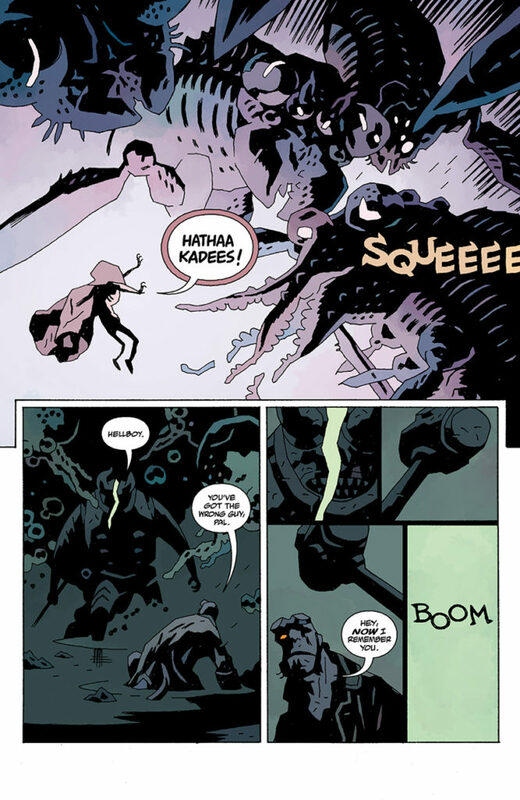 You can even see that quirky writing style in Mignola’s non-Hellboy works such as The Amazing Screw On Head (whose printed and animated forms I love to pieces). Finally, we come to the literal end. After more than 20 years in publication, Mignola returned to write and illustrate the final chapter in Hellboy’s life and the culmination of his destiny. This is a remarkable achievement for many reasons, but chief among them might be that there is an end at all. In a world where serialized works are almost uniformly worked to the point of failure and cancellation, it’s incredible that a popular creator with an award-winning IP would have the grace and forethought to end his series. 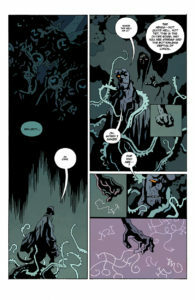 That Mignola did it in such a beautiful manner shows his respect for his work, his characters, and his fans. 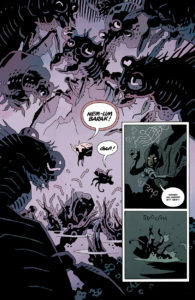 To talk about Mignola’s work is to talk about a link to the past. A continuation of older storytelling, older ideas about what scares us. 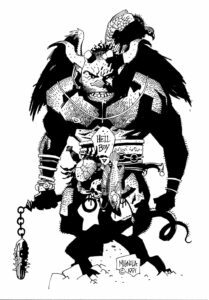 It’s about tapping into those great, epic tales like Conan and John Carter and mixing them with the pathos of black and white monster movies. And somehow, the results are unique. Immediately identifiable. A Mike Mignola illustration has a hero with slumped shoulders, as though they carrying the weight of the world on their back. Frank Frazetta poses the scene before it’s carved out of limestone and left to the elements. After a hundred years, Universal studios sets up to light and film the scene before it’s colored flat with paint stolen from John Buscema. The whole process tells a story. Everything is solid, heavy, and strong, telling the reader an ageless story that feels both familiar and fantastic. Mignola’s work is one, long story that stretches back before him. And it might just feel timeless forever.